The 3D Printing Tech Zone at CES was full of machines that are aiming to solve this problem. Many 3D printer designers arebuilding more straightforward machines for entry-level makers, and we're seeing this trend being implemented in many different ways. If the genre keeps moving in this direction, 2014 could be the year of the 3D printer. MakerBot's CEO Bre Pettis said it best during a CES press conference on Monday: "The question is not, are you going to buy [a 3D printer]?,' but which one are you going to get?'" Pettis unveiled a new line of MakerBot Replicators on Monday to appeal to people with different experiences and skill levels. My prediction is that it won't be the high-end $6499 Replicator Z18 that breaks boundaries, but instead the $1375 Replicator Mini. This entry-level printer, which Pettis dubbed the "point-and-shoot" of the group, was designed with consumers in mind. It's compact and easy to use, and only has one button, showing off MakerBot's new one-touch printing solution. It's already optimized for speed and doesn't require any leveling, so it's pretty much good to go as soon as you open the box. And it has the power of the MakerBot name behind it. What's really killer about the Replicator Mini is that it has much of the same hardware as its more advanced brothers. It has the same magnetic Smart Extruder that's easy to remove, a camera to record the printing process so you can share footage with your social media accounts, and wireless connectivity that notifies your mobile device when a print is finished or if you're low on filament. MakerBot is also trying to solve the problem of not knowing what to print. 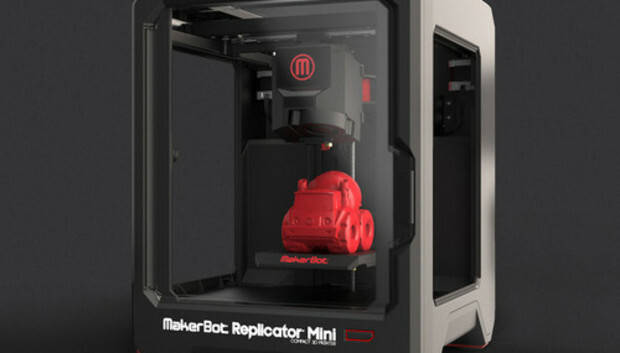 The company launched MakerBot Entertainment, a new digital store with complex, full models of small toys available for purchase. Assembly requires no additional supports or glue: All you need to do is buy the file and print it. There are six different collections to start, including sets with trucks, animals, and rocket ships. Toys can be purchased individually starting at $1, or as complete sets that start at $10. Cost can be just as off-putting as difficulty, and many of the printers we saw were a bit friendlier on both sides. XYZ Printing's Da Vinci is truly a plug-and-print machine, mirroring the steps you would take to set up a normal at-home inkjet printer. Just connect it to your PC via USB, install the drivers, load the filament, and print. The filament even looks like a big cartridge, and instead of manually feeding filament from the spool to the extruder, you just install it into the cartridge area and the Da Vinci does the rest. Cel's Robox follows the plug-and-print concept as well. Though it does require a bit of calibration to level the printing bed before you use it, the Robox's AutoMaker software will walk you through the process step-by-step. Then, it's just a matter of selecting your file and pressing start. Because XYZ Printing is an offshoot of a larger inkjet printer company, the Da Vinci is relatively affordable at $500. It's ideal for total 3D printing noobs who want to ease into the process. The Robox costs $1400, which is on par with other pre-assembled printers. Yet the main difference between the two is that the Robox aims to be a bit more future-proof: It can accommodate a second printing extruder, or the main extruder can be easily swapped out in case printing with materials besides ABS or PLA plastic becomes the norm (like food!). The designers at Sixense don't think the machines are the issue, and they focused instead on creating an intuitive platform for building models. Designing or manipulating files to print on most 3D printing software can be a big challenge for beginners or for people without industrial design backgrounds (read: most people). This software, called Make VR, lets you take existing shapes, change them, and piece them together to make your own models. You can then export that design directly to Shapeways and print it there, if you don't have a 3D printer at home. Your designs live in a virtual reality world that you can share with friends. It kind of turns building 3D models into a social gaming experience. What really makes Make VR incredible is how it's used with another Sixense machine, the STEM System. STEM is a wireless motion-tracking platform designed for video games and other virtual reality worlds, and you use two handheld controllers to track your movements and gestures. When using STEM to make 3D printable objects, it feels as if you're building something with your own hands. You can physically reach out to grab a (virtual) tool, turn it over, and mimic a hammer motion to build or punch holes. STEM captures your motions really fluidly, and the process looks like a natural build. Manufacturers have a lot to gain by making 3D printing technology less scary and more greenhorn-friendly, but the key is in variety. Veterans to this technology will want more customizable machines that they can tinker with and run open-source software on; Beginners will want plug-and-print models with more straightforward software and a full printing marketplace. Because so much of what was announced at CES this year is more approachable to young adults and the next-generation of makers, 2014 might just be a pivotal year for the printer--and not just for making tchotchkes.